Another year is about to come to an end. It seems that the days passed very quickly this year, as I feel as if I just posted my tribute to the horses that passed in 2016. But another year has gone by, and this year was an equally hard year in terms of horses lost. Sometimes the pain of the loss, is more than I can bear, and some days I feel as if I no longer want to go to the mountain. I just want to lessen the pain of the loss of so many familiar faces. But I will continue to go, the strong pull of the mountain is too great to walk away from, it calls me from within. This year we have lost 12 horses, and there are some missing. I am going to be including the recently missing ones in this post as well. One foal was removed, and I will be including him too. That will bring the total to 14 horses and 3 foals for a total of 17 horses possibly gone off the range. This year there were 8 foals born, three died and one was removed leaving a total of four 2017 foals still on the range. The year of 2017 (so far) has left a negative growth of -13. I felt in order to properly honor each horse that is no longer with us, I would go back over the years and find photos of the horses that I personally took. There are a few from others here, but for the most part, each photo was taken by me. It took me several days to go through the 1000’s of photos I have of the horses to find just the right ones. In many ways, it became a healing exercise for me. Seeing these horses in the land they loved. Each one did live a good life, wild and free. Some just left this earth way too early. Below are the horses we lost and those that are missing. Listed in alphabetical order. 1. Audobon, born in 2000, she is the daughter of Feather. This quiet mare was with Morning Star for many years, and then in 2014, she and her daughter Niyaha joined up with the handsome stallion Hamlet. Hamlet and Audbon produced two foals, Penn (Paris) and Quicksilver. Unfortunately, Quicksilver did not survive within a month after birth. Something happened last winter/spring and Audobon was separated from Hamlet. Paris ended up in the Dryhead with the stallion Jesse James. Audobon has not been seen since early spring 2017. 2. Belle Starr, born in 1993, daughter of The Old Mare and Hercules. Belle Starr was last seen early 2017. I usually saw her up Sykes in the early spring. 3. Baja, Reappeared!! Finally showed himself after missing since last fall on May 31, 2018!! Born in 1996, son of Tonapah and Looking Glass. Baja was last seen earlier this fall. London was seen with Bacardi and Quahneah in September. With Washakie’s health declining, the fate of their foal Renegade was in jeopardy. It is assumed that Washakie died and Baja and Renegade remained with her. Somehow Renegade found his way to his sister’s who were with London. Renegade was removed (see his post listed below). Baja and Washakie were together for 14 years, I have a very strong feeling that Baja just simply gave up after Washakie died. He may reappear, and I hope he does. To me, Baja was one of the most beautiful stallions, not only in looks, but by the way he cared for his band. He leaves behind just one offspring with Washakie, Quahneah. My hope is she will remain on the range to carry on his beautiful legacy. 4. Blanca, born in 1998, daughter of Phoenix and Raven, full sister to Cloud. She was found dead on September of this year, lying peacefully in one of the upper meadows. This one is a hard one for me. Blanca was not only the matriarch of her band, but also the type of mare that I think we all thought of as a perfect example of how a lead mare should be. Blanca was always there to help the young ones in her band, and also her band stallion Cappuccino. She stood by Moenkopi during Obsidian’s death in 2014, (OBSIDIAN). This past summer, Cappuccino was wounded and lame and while he healed, Blanca held the band together and watch diligently over her stallion. I could tell story after story of the touching things this mare as done. She had been with Cappuccino since early 2011. She produced her last foal, Kalispell, with Lakota, unfortunately, Kalispell died in the winter of 2010-11. The thing I will remember about her the most is, Blanca could absorb the evening light with her golden coat, like I have rarely seen another horse do. She was a glowing star, and I will deeply miss her presence on the mountain. 5. Cascade, born in 1997, daughter of Aspen and Lone Wolf. She spent her life in the Dryhead. She had a special place in Laura Curtis’s heart and below are some of the photos that Laura took of her. Cascade has been missing since early 2017. 6. Corona, Missing, born in 1997, son of Sorita and Sam. Last seen sometime earlier 2017. I have had only a few memories of this beautiful stallion. The two most memorable ones were when I discovered Norte had been born. Traveling down Sykes, they were directly off the road in a very steep section of the road. The other was when they traveled up to the top of the mountain in July 2013. 7. Custer, born in 1996, son of Sitka and Shaman. With his long-time mare Winemucca’s death in the fall of 2016, Custer, Fiasco and Prospera stayed together. In January, 2017, Galaxy was seen with Fiasco and Prospera. Custer has not been seen. I have thousands of photos of Custer. He seemed to always be around and his beautiful patterned coat was a treat to photograph. His kind and caring personality made it easy for me to spend hours with him. His presence will be greatly missed. 8. Fiesta, born in 2005, son of Phoenix and Teton. Last seen, September 2016. Fiesta, a horse that is larger than life. I don’t think I can find the words to describe this horse. He gave me so many gifts each and every time I saw him. The gift of unconditional love, the gift of laughter, the gift of tears, the gift of accepting myself for what I am and being happy with it. He was a true teacher to those of us that paid attention to what he had to say. Fiesta, you are so missed. I just could not get used to not seeing you with your family, and I don’t think I ever will. You were the one who would rush out and protect them from any danger. You loved your family, starting with your good friend Horizon. Looking back over your photos, I saw how much you cared for him when you both were just young carefree bachelors. You would risk your life to protect them at any cost, and ultimately I do believe you died protecting them. Rest in Peace big, beautiful, silly boy, you will always be a part of my heart. Although he survived that, he ended up not being able to beat the next odds, he was last seen in the fall of 2016. He was still a bachelor at the time of his death, but he always found time to mentor the younger bachelors. He would often be seen with Orlando and Naolin. 10. Isadora, born in 2008, daughter of Starman and Rosarita. Isadora died giving birth to her foal this fall. FOAL#7 The foal did not survive. The first time I saw Isadora was when she was still in her family band. It was the 3 of them (Starman, Rosarita and Isadora) walking down the dirt road in the Forest Service part of the range. I remember being so impressed with her amazing marking she had on her face. Isadora gave birth to a little filly named Lemhi the following spring. Starman had lost his band to Mescalero. Sadly, little Lemhi did not survive the winter of 2011-12. Isadora was with Morning Stars band at the time of her death. 11. Medicine Bow, born in 1999, son of Twiggy and Cortez, he has not been seen since fall of 2016. I had the privilege of seeing Medicine Bow several times. He spent his time on the Dryhead and Middle/Lower Sykes. His unique color was what caught my eye. He was a red dun sabino. I think Matt Dillion told his story best. You can read his post here: MEDICINE BOW. 12. Raeleah J, born in 2017 to Icara and Johnston. Died about a month after birth. You can read her post here. RAELEAH. These photos were taken by Dennis McCollough. 13. Renegade, born in 2017 to Washakie and Baja. Renegade was removed after discovering him without Washakie. Washakie is presumed to be deceased. The photos of Renegade after he was removed are taken by Nancy Cerroni. 14. Ryden (Rainbow), born June 28, 2017, daughter of unknown parents. You can read about her here: RYDEN Ryden (Rainbow) died a day after her birth. 15. Santa Fe, born in 1995, son of Twilla and Two Boots. Santa Fe’s remains were found in March 2017. Santa Fe, where to I begin. He only wanted someone to love, always trying to gain a mare. His one remaining offspring on the range is Mandan (Santa Fe x Demure), but he was not able to raise his son. Doc stole the band before Mandan was born. After that Santa Fe worked hard to gain another mare, and he did. Judith a beautiful filly, but he would not be able to hold on to her either. Judith was removed in 2012. I was there when they removed her. I can still hear Santa Fe’s heartbreaking cries as they loaded her unto the trailer and took her down the mountain. My heart broke for him that day. He was unable to acquire another mare, but spent the last several years trying. He dogged Coronado’s band for what seemed like forever. It was late June of 2014 where I saw a small crack in Coronado’s vigilance to keep Santa Fe away. He seemed to be warming to the idea of Santa Fe acquiring Manulita, and she was very interested. But, it would not happen. About a week later a helicopter fly over the range, causing a chaotic stampede of horses. It was during that time that Coronado lost his band to Irial, and Santa Fe’s chances were once again ruined. He would still continue to try, but his age was catching up to him. He spent most of his time with old and new bachelors, Coronado being one of them. They had fought violently, but had somehow put that all behind them. Santa Fe and his determination will always remain with me. 16. Seattle, born in 1997, son of Tacoma and Three Bars. Missing. I can’t remember when the last time I heard of someone seeing Seattle. My best encounter with him was on the mountain top in July 2013. I had seen him several times in the Dryhead, but most were from a distance. Yes, Seattle is a Dryhead horse, but the summer 2013 he ventured up on the mountain for a day. I was happy I was able to capture it with photos. 17. Washakie, born in 1994, daughter of Sitka and Shaman. She was an amazing mare. Nancy tells it best with this post WASHAKIE. Washakie was a mommy machine. She had a foal every year since she was 2. Despite being vacinated with PZP, she continued to produce and was labeled a “non-responder”. But despite her many foals, she and her stallion of 14 years (Baja) now have only one offspring on the range. Quahneah. She must stay and carry on this perfect couples legacy. My encounters with Washakie were many. The line I always heard from my guests and friends were: “she is HUGE”, she must be ready to foal any day. But this dear soul would keep us all waiting until SHE wanted the new little arrival to be born. Abbie and I blessed to see two of her foals shortly after their birth. Quahneah and Renegade. Washakie and Baja had a love that few animals or humans have had. A constant love and devotion to each other and their family. Rest in Peace dear Washakie, you will be so very missed. Rest in Peace dear ones, run with the wind, I still feel your spirits on the mountain, and I am sure I always will. This year will be the 4th year of “Lakota’s Gift”. 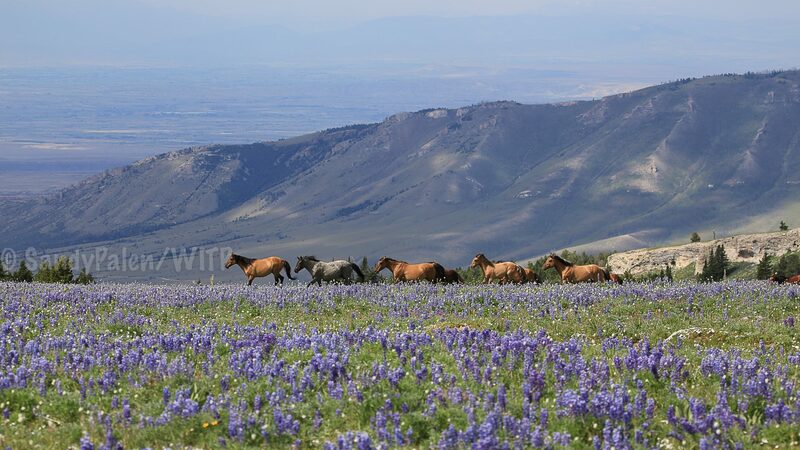 For the past 4 seasons, I have awarded a four day camping trip to an inspiring Pryor Mountain Wild Horse follower in honor of my favorite horse, Lakota. This person needs to be passionate about this special herd of horses and have some basic knowledge about them. To be considered for this award, please submit an essay telling why you should be awarded this gift. Please include some information about yourself, what you know about the horses and what you hope to give back to the horses by being selected for this award. All essays must be submitted by February 1, 2017. All trips start and end in Cody, Wyoming. Past recipients of this award have been: Jonathan Stander, Brianna Harvey, Abbie Branchflower and Lexi. Below is a slideshow of some of the many photos that I have taken of Lakota. Please give it sometime to upload before trying to view. Every year we loss a few horses, none are ever easy, or pass unnoticed, but some are harder to accept. Each of us have our favorites, whether we want to admit it or not. This year is no exception to that, but to me, it is an especially hard year. The mountain just will not be the same without these horses. And so, with this post, I tell you about what I know of them and dedicate in their honor. 1. Tonapah, born in 1986, she was the oldest living horse on the mountain for many years. Her sires are unknown, but she had many offspring, Lakota, Warbonnet, Baja and Brumby are just a few. Part of her will live on through these horses. Whether that is true or not, this wise old mare was a great asset to the Horizon/Fiesta band. Taking this unorganized and unsettled band under her care, she turned them around to become a stable and strong force on the mountain. Tonapah never showed us her beauty on the mountain top this summer. I loved to tell guests, that she was the oldest mare on the mountain, she was a beautiful and strong mare for all those years, she never looked her age. The saying is true for her “you are as old as you feel” and I think Tonapah passed to the other side feeling beautiful and young. I will deeply miss her. 2. Topper Too, born in 1995 to the mare Topper (who died in the winter of 2014) and the stallion Beauty. She has only one known offspring on the mountain, Fiasco (who is also the daughter of Chino). Topper Too and her mother Topper were long time mares of the stallion Chino. I smiled a million smiles watching mother and daughter with Chino. They were two of the most unsocial horses on the mountain while together with Chino, and made it clear many times that they would rather not be around humans. Chino lost them in 2013, Topper went to Corona’s band and Topper Too went with Baja. I did not think they would stay separated long, but they continued to live out their lives apart from one another. Topper Too died from a lightning strike, while in Mescarlo’s band, on May 31, 2015. The famous Toppers “over the shoulder” look. Topper 1 and Topper too, September 1, 2012 A typical greeting from these two! Chino, Topper One and Topper Too. Chino and Topper and Topper Too. May 2012. 3. Chino, born in 1993, to the mare Hightail and the stallion Hercules. It is with much sadness and tears that I type about Chino. He was last seen on July 4, 2015 after saving the life of a young foal (you can read my post about that, by clicking on CHINO.) As you can see from the photos above and below, I saw this stallion constantly. He was always one of those horses that showed himself to me. I pray that he may still show up, but in my heart, I feel he is gone. But what an amazing life he led! There are many stories I could tell about Chino, but none as great as on the last day I saw him. He is the only stallion on the mountain that has lived in all areas of the horse range: Dryhead, Burnt Timber, Sykes, he knew this mountain better than any horse has or will. He was a patient stallion, putting up with his unsocial mares ( Topper and Topper Too). He seemed to give them up without much fight and go into his second bachelor hood with ease. He excepted it, but never lost his drive. I watched him in April 2014 dog Cloud and his band for an entire day. Chino has been one of those horses that I never really realized was a clear favorite, but my camera knew, I have hundreds of photos of him. My heart aches to think of the mountain without him. 4. Hightail, born in 1990 to the mare Calamity, Hightail has been a fixture on at the entrance of the Dryhead for years. She is one of the “Greeters”. She was last seen in August of this year, so there is still hope that she may show herself, but in the many years that I have seen her, I have never seen her away from her close companion, Seneca. Hightail was the very first wild horse I ever saw. She very quietly and purposely walked slowly in front of my truck at sundown on July evening. I will never forget that moment. She then continued to lead me to the rest of her band, that included Admiral. I find it sadly ironic that she and her son Chino disappeared within a month or so from each other. Perhaps this mother and son are together in another place, healthy and running with the others that have passed before them. 5. Issaquah, born in 2008 to Bakken and Seattle, he has been missing for over a year. I saw him alone several times part way up Sykes Ridge Road, so maybe he will show himself. That is a very vast area that few people travel, he may still be there. In his early bachelor years, Issaquah was always with the stallion Hawk. In fact, I called them HawkandIssaquah, because they were so inseparable. Issaquah died way before his time, unlike the horses above, he had not lived a long enough life. As of today, these are the horses that have passed or are missing. My wish is that this year will draw to a close without another one added to this list. Rest in Peace, you lived wild and you died wild, just as it should be.